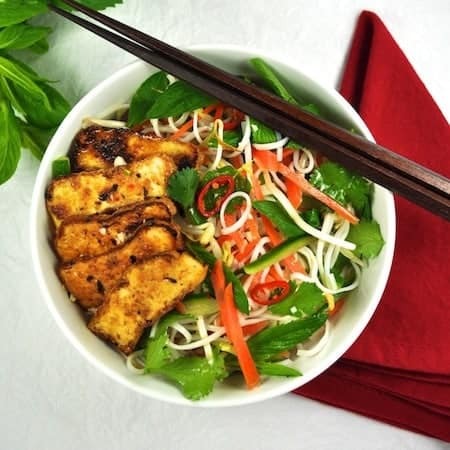 Vegetarian Vietnamese Noodle Bowls! You’ll love how crispy and caramelised the tofu is. This is a beautiful, guilt free bowl of fresh delicious. Rice noodles, carrot, lettuce and bean sprouts topped with marinated tofu, drizzled with a sweet, salt and sour Vietnamese noodle sauce. Incredibly healthy with a freshness that only herbs can bring to it. Easy light, healthy noodles topped with irresistible caramelised tofu, fresh vegetables and herbs, then drizzled lightly with a zingy sauce. The tofu is so good, I could just eat a plate of that! Don't be daunted by the list of ingredients - the ingredients for the marinade and sauce are largely the same. Combine tofu and marinade ingredients and set aside for 20 minutes or so to let the flavours develop. Soak the rice stick noodles in hot water for 6 to 8 minutes (see note 2). The noodles are ready when they are "al dente" - still firm to touch. Rinse the noodles under cold water. Cook the marinaded tofu over high heat on the stovetop, or it is also great done on a BBQ, until caramelised and slightly crispy on each side. To serve - toss together the noodles with the vegetables, place into bowls and top with tofu, then drizzle with sauce. 1. I like to use rice stock noodles because they are thick which I think works well with this dish, but you can also make this with vermicelli noodles (which just need to be soaked in hot water). 2. You can use this soaking method for thin and medium thickness rice stick noodles, as well as vermicelli. But it won't work for the thick rice stick noodles which will need to be boiled. If in doubt, cook according to the packet instructions. Another totally scrumptious recipe. Thank you!! Awesome, thank you. I made this tonight and it is absolutely delicious. I don’t think I’ll get to test how long it keeps in the fridge because I’m going to eat it all tonight! For an unami boost I add fish sauce to the nuoc cham. I also found it easy to chop the lemongrass in the blender for a few seconds. This was absolutely delicious! It was my first time cooking with tofu & it turned out so well, I know I’ll be making it again. Thanks for another keeper, Nagi! This is delicious! I made one substitution because I live in a remote Oregon town (dried chili pods I soaked instead of birds chili) this was very very wonderful thank you so much for posting. This is so good, my new fav! Thanks for sharing! In this case it’s totally appropriate to applaud yourself! I’m in a bit of a Vietnamese cuisine phase atm and this is perfect. I didn’t have rice stick noodles, so I used udon noddles, left out the tofu (our opinions don’t meet on that subject), swapped out one cup of the lettuce for shredded bok choy, and added a cup of shredded red beets, and it turned out fantastic! I get the feeling that this is an amazingly adaptable dish that can be changed to suit any occasion. Call it a KEEPER! YAY!!! I’m so glad you loved it Shalryn!!! That sounds good, I’ll have to try it this way. The tofu was amazing though! I started out using the stove top but then put it in the oven for 15 minutes & it firmed up. How did I miss your site dear. This looks so delicious. Going to try it this weekend! I didn’t publicise it! Bit shy, being so new to the blogging world! Thank you so much for dropping by Priya, I am honoured that you came to have a look!